where [hostname] is the name of the server that you are testing the connection to. See the section "Determining [hostname]" below for help with the hostname. 3. You will have to wait up to a minute or more for the test to complete. It will generate a list of the connections along the way and some information about the speed of the steps along the way. 4. Send us the complete results (every line) for analysis. Hostname is the name of the server that you are testing the connection to. See the section "Determining [hostname]" below for help with the hostname. If you have an older Macintosh, you may need to acquire third-party software. Go to http://www.tucows.com and do a search for "Trace" on "Macintosh". 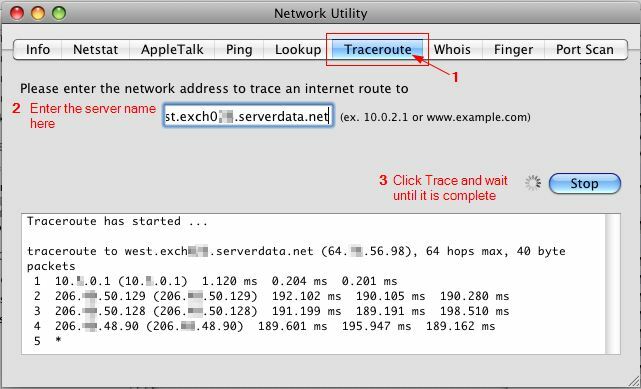 Programs like the DNS Expert Professional will allow you to run a traceroute. Then send us the results for analysis. If you are a Enterprise Exchange email customer, you can use the hostname for the server specified in your email account settings for the email program you are using. If you have been instructed by Customer Service Support team to conduct this test, our team will tell you what hostname to test for.